Our black glass photo plaque offers a unique blend of contemporary styling and the traditional elegance of beveled glass. Perfect for that special photo event. 11"x 14" plaque size for your 5" x 7" photo with special backing, allowing for easy insertion of your photo or document. . Vertical or Horizontal plaque orientation options to accommodate for your vertical or horizontal photo. Additional plaque sizes available to accommodate your photo size. This Photo Plaque - Photo 5" x 7" Glass Black BG-FP14BBS is part of our Photo Plaque Series of products, check out other products & options available in the Photo Plaque Series of our selection. 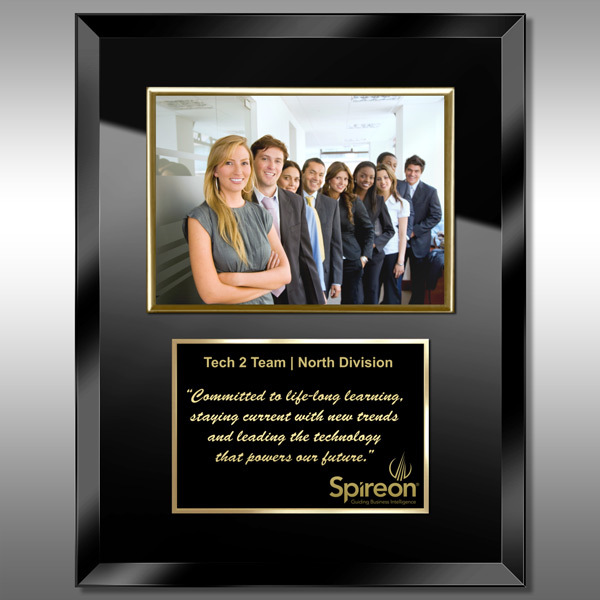 This Photo Plaque - Photo 5" x 7" Glass Black BG-FP14BBS can be modified to your requirements and is available for your corporate award programs.